KIEV, Ukraine -- Ukrainan President Petro Poroshenko has announced plans to introduce a 30-kilometer demilitarized zone in Luhansk. The president has also instated a well-known volunteer as Kiev's governor of the war-torn region. The buffer zone, which was agreed between Ukraine's warring factions under mediation of the Organization for Security and Co-operation in Europe (OSCE) and Russia, requires all tanks and artillery to be withdrawn from the region. The move aims to bring an end to the "permanent shelling." "Instructed the contact group to sign an agreement on the buffer zone, to ensure that militants are unable to bombard the peaceful civilians of Donbass!" In Berlin, the German government welcomed the move. Should the decision be implemented, it would be "a big step towards a more resilient and sustainable ceasefire," a spokesman for Germany's foreign ministry said. Pro-Russian separatists in the neighboring region of Donetsk have also said that weapons with a caliber of less than 100 millimeters had already been withdrawn three kilometers from the frontline. 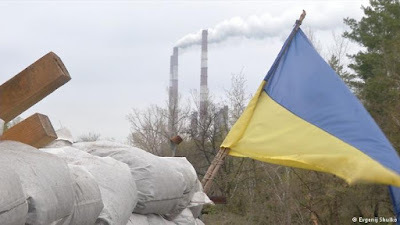 Despite the hopes for the buffer zone, shelling has continued in the Donbass region. Ukraine's army command in Kiev accused pro-Russian separatists of taking several military positions by using tanks and grenades - claims which the rebels deny. Since the conflict broke out in eastern Ukraine in April 2014, the Ukrainian government has controlled only parts of the Donetsk and Luhansk regions. More than 6,600 people have been killed in the violence, which has brought Ukraine - already strapped for cash before the conflict - closer to financial ruin. The European Union announced on Wednesday that 600 million euros ($654 million) of financial aid had been transferred to Ukraine. The payment was the first installment from a new 1.8 billion euro loans package. "Today's transfer reflects the complete determination of the EU to assist Ukraine in these difficult times" European Commission Vice President Valdis Dombrovskis said from Brussels. Ukraine previously received aid from the EU in 2010 and 2014, worth a combined 1.61 billion euros. Also on Wednesday, Poroshenko appointed a well-known volunteer as governor in Luhansk. Signing the order live on television, Poroshenko said Heorhiy Tuka, known for his efforts helping Ukrainian troops with supplies, was a "man with an immaculate reputation, intolerant to corruption and [who has] Ukraine in his heart." The 51-year-old former telecom executive will replace hard-liner Hennadiy Moskal who had decreed that civilians were not allowed to travel between rebel-controlled areas and the government-controlled part of the region.